Hi everyone! As we mentioned in our last post we were preparing for some fun. Well, this week we are off to our neighbor to the North to meet some new friends and enjoy some family time. Yep, it’s another road trip; although not quite as epic as the one a few years ago that took us to many of the same places. So while we are away, you’ll forgive us for not checking in on many of your wonderful blogs. We’re going to unplug for a short time and recharge. We’ll be back next week with another French recipe and hopefully some great vacation stories to share. Until then, we thought we’d share this little non-recipe of a recipe with you. It was a HUGE hit in our house and it just happens to involve lobster which is reminiscent of that trip a few years back. Just search “lobster” on our site and you’ll see what we mean. We took a basic deviled egg recipe – hard-boiled eggs, add the yolks to a bowl, and mix them with Dijon and mayo. This time we then added a bit of dill, some Champagne vinegar, diced shallots, and of course some chopped up lobster. (We had claws on-hand after a tasty special at Costco.) The measurements on today’s recipes are approximates. You can easily adapt this to your own taste preferences. Once the mixture was added back into the egg whites, we topped them with a pinch of truffle salt, some chives and a sprinkling of paprika (regular, not smoked, as we didn’t want to diminish the taste of the lobster). Now you can see why these were such a hit. Mike and I both gave them 4 spoons. Hands-down. No questions. Miss A gave them 100 spoons. I have never seen her eat so much of a non-dessert food in my life. I’m not kidding. She put these little devils (pun intended) away! But Mr. N, he insists on saying they were 3-1/2 spoons….despite also devouring them and fighting with his sister over the last one. Hmmm. I’ve determined his vote is due to either not wanting to appear as a conformist, or that it wasn’t dessert and therefore doesn’t deserve a 4 spoon vote. Hi Kristy! Sorry I’ve been MIA. Hope you are enjoying the summer with your beautiful children. 🙂 I have never had deviled eggs until I came to the US but ever since I tried my first bite, I fell in love. I bought a special plate for it too, but haven’t really made one myself (but I’m the one who eats at least 3 pieces at potluck or any party when this dish is served). Yours look fancy and beautiful. I gotta try your recipe!!!!! You took a simple recipe and took it to gourmet level! I hope you had a wonderful trip. So sorry for missing a few of your posts, had a crazy couple of weeks! …thanks for the visit to my site and I’ll be sure to place you in my reader. Cheers! 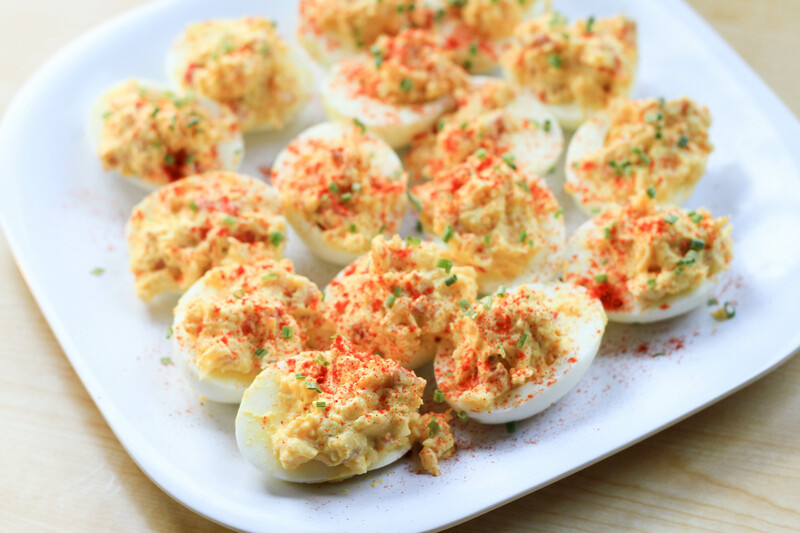 I have always loved devilled eggs but yours win hands down! Fabulous and scrumity! Lobster and eggs?! OH MY! This is great!! I get slaphappy when I go to an event and see deviled eggs – I love them!! I just came across your blog, and I think I will enjoy reading some of your recipes, this one looks fantastic. 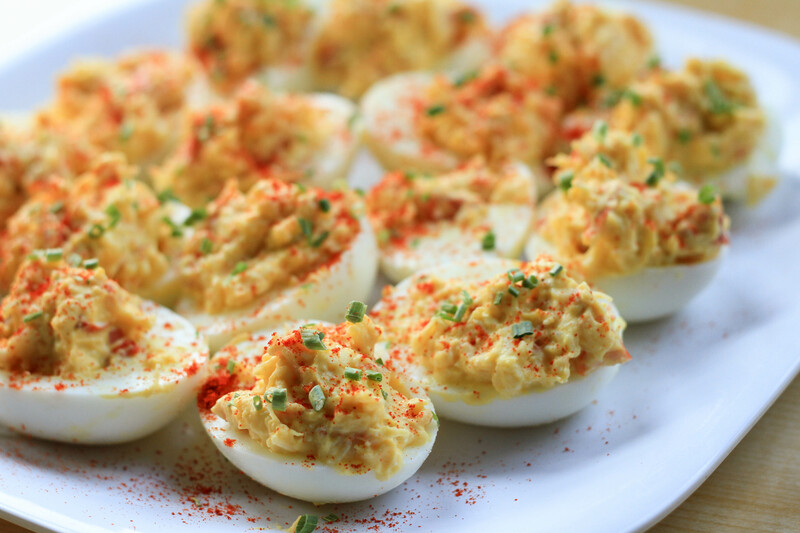 Your deviled eggs are one of a kind! The pictures make me just drool with an appetite so strong it makes me crazy! What a great take in an old favourite Kristy, I love the lobster addition. Did you use a cake decorating tip to add it back? Thanks for reminding me of this old favourite, I’ve got a cocktail party coming up and these would be a beautiful addition. Looks like you did, must be the lovely lobster chunks. 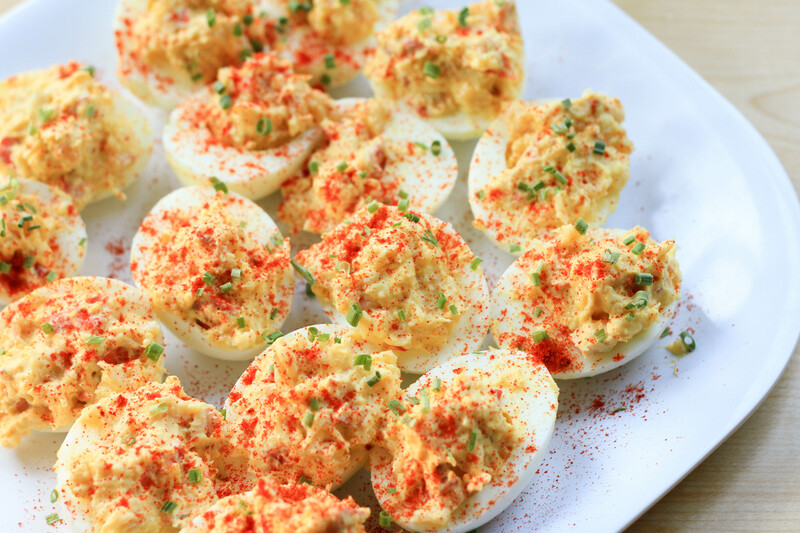 Devilled Eggs are awesome, but don’t try to take them on a picnic! They don’t hold up well to being bounced around in a tupperware box in the back of a car :p.
Yours look lovely Kristy, and I love the addition of lobster (you know I almost never eat lobster… it’s not as popular (or common) in Europe as in the US I think…?). I hope you’re all having a nice trip… hope you’ll share some photos on your return! Yay for northern friends! (sorry, just had to work that in there ;-)). 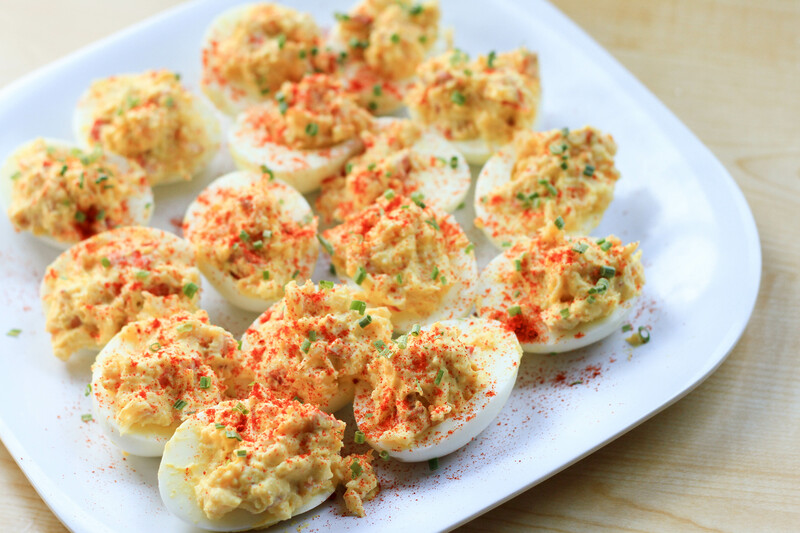 These devilish eggs look delish and I tell you, you and your hubby have me dreaming of lobsta’ all of a sudden! “I have never seen her eat so much of a non-dessert food in my life” heehee, love it. (Champagne vinegar curls my toes). I hope you all have a wonderful time away. 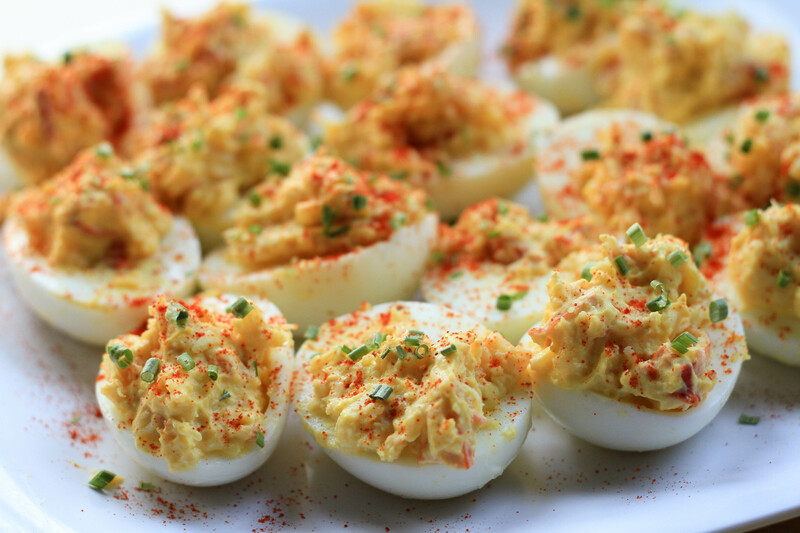 What deliciously decadent deviled eggs. Have a great trip. I love the idea of a four spoon link:) wow, no doubt these tasted fantastic, I cam tell from your photo and the list of ingredients.. All of which are faves of mine! Have a lovely break! 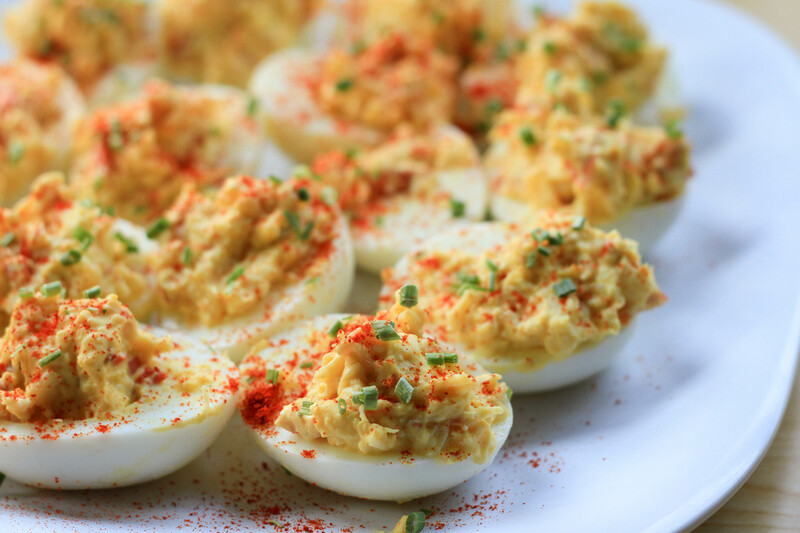 I love making deviled eggs (as you can tell from my blog). Have a great vacation, you deserve it!!! Reblogged this on Smiley for better ( new day, new life…. new beginning). These are one of my all time faves!! Why have I never thought of adding lobster to devised eggs sine both are favorites! Enjoy your time away.